"Average True Range (ATR) based risk." Percent Volatility Positioning is based on Van Tharp’s book “Trade Your Way to Financial Freedom”. 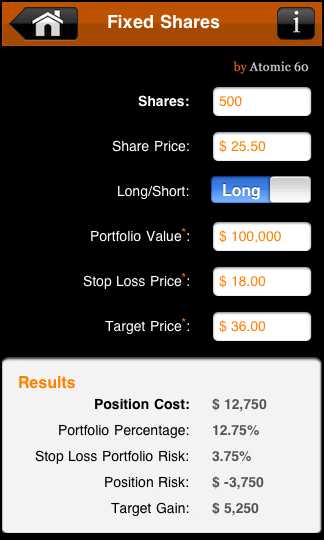 This system uses a stocks’ volatility to determine position size. Volatility is defined as the Average True Range the stock fluctuates over a given time period. For example, stock ABC may move $1.25 up or down on an average trading day. See FinViz.com for a stocks current ATR figures. 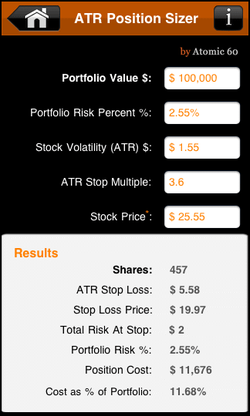 To use this risk management system, enter your Portfolio Value, Portfolio Risk Percentage amount and the Stocks Average True Range (ATR) . Next enter an ATR Stop Multiple. By using a multiple grater then 1, you increase the ATR by that multiple. So if your ATR is $2.00 by adding a 3 multiple you increase the ATR to $6.00. This increases your Stops fluctuation range giving your trade some breathing room before its stopped out. The higher the multiple is, the less shares you will buy to stay within your defined Portfolio Risk Percentage. An ATR multiple of between 1-5 is common. Next enter the stocks closing price and optional broker commission. My portfolio value is $100,000. I’m willing to Risk 1% of my portfolio on Stock ABC which is trading at $28.50. ABC has an ATR of $1.50. I will add a 3 Multiple to the ATR. Broker commission is $10.00. Based on the above, I will buy 222 shares of ABC. My ATR Stop Loss is $4.50 setting my Stop Loss Price at $24.00. This limits my risk to a max of $999 which is about 1% of my portfolio. The position will cost me $6,337 which is 6.34% of my total portfolio value.